Captain Steven Gerrard grabbed a late winner for Liverpool against 10-man QPR to keep alive his side's slim hopes of Champions League qualification. 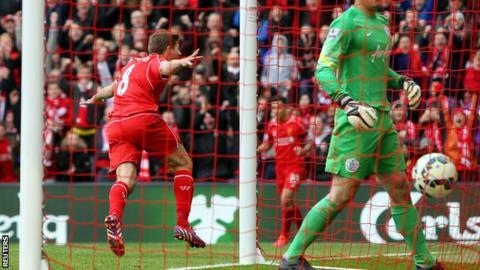 Gerrard headed past Rob Green in the 87th minute having missed a penalty with the score at 1-1. Philippe Coutinho put the Reds ahead with a great strike before Leroy Fer volleyed in. Nedum Onuoha was shown a second yellow, before Gerrard's winner left QPR one defeat away from relegation. Both sets of players wore black armbands after the announcement before the match that QPR defender Rio Ferdinand's wife had died following a battle against breast cancer. Gerrard also presented Hoops midfielder Joey Barton with a bouquet of flowers to give to Ferdinand. Meanwhile, a plane was flown over Anfield before the match with a banner attached calling for Liverpool manager Brendan Rodgers to be replaced by former boss Rafael Benitez, with the Reds looking likely to miss out on a top-four finish. However, his captain's winner means there is still an outside chance of Champions League qualification, particularly after Manchester United were beaten in the late kick-off by West Brom. Liverpool are now four points behind United with nine points to play for. The 34-year-old, who joined Liverpool as a youth player in 1987 before turning professional in 1998, may have thought another chance to sign off with a goal at Anfield had gone when keeper Green guessed correctly to push away his spot-kick. But with just three minutes remaining, the midfielder - bound for LA Galaxy - rose highest to nod in Coutinho's corner. Liverpool have one more home game remaining - it promises to be an emotional one for the Reds stalwart. The victory sees Rodgers's side narrow the gap to fourth-placed Manchester United to four points, after West Bromwich Albion won 1-0 at Old Trafford. Liverpool took the lead against the run of play when Rickie Lambert squared the ball to Coutinho, who brilliantly placed his effort beyond the reach of Green. The home side should have increased their advantage after the break, but both Adam Lallana and Raheem Sterling inexplicably fired wide from close range. And the Reds were punished for those misses when Fer slotted in with a controlled volley from Barton's corner. The Dutchman lifted up his shirt in celebration to display a tribute to team-mate Ferdinand. Liverpool should have retaken the lead when Onuoha gave away a penalty after he pulled back Martin Skrtel. Up stepped Gerrard, but the skipper struck a weak effort which Green easily saved. Moments later, the Hoops were reduced to 10 men when Onuoha brought down Jordon Ibe, but they still looked comfortable for the draw. However, Gerrard had other ideas. Read minute-by-minute updates as the match happened. Reaction to the game, as well as updates from Saturday's action. "Steven Gerrard is one of a unique group of players that when they need to respond, they do. An outstanding header gets us the win. "It is a world-class talent. There is a very small group of players in that bracket when, in the big games, they score the big goals and make the big contributions and he has done that throughout his career. "He missed a penalty and you think it may go against us but there was no-one more determined to make up for it. "It will probably only be when he is gone that people will recognise what a sheer talent he is." "Is it almost impossible to avoid the drop? Yeah, but the word 'almost' is what you need to cling on to. "The fans can see what the players are trying to do. We are not going out with a whimper. "We hope we can muster up three more fantastic performances to get those nine points and make the last few weeks interesting." Match ends, Liverpool 2, Queens Park Rangers 1. Second Half ends, Liverpool 2, Queens Park Rangers 1. Attempt saved. Jordon Ibe (Liverpool) header from the left side of the box is saved in the bottom left corner. Assisted by Philippe Coutinho with a cross. Raheem Sterling (Liverpool) wins a free kick on the left wing. Attempt missed. Clint Hill (Queens Park Rangers) left footed shot from outside the box misses to the right. Assisted by Sandro following a set piece situation. Leroy Fer (Queens Park Rangers) wins a free kick on the left wing. Hand ball by Sandro (Queens Park Rangers). Substitution, Liverpool. Lucas Leiva replaces Steven Gerrard. Goal! Liverpool 2, Queens Park Rangers 1. Steven Gerrard (Liverpool) header from the centre of the box to the bottom right corner. Assisted by Philippe Coutinho with a cross following a corner. Corner, Liverpool. Conceded by Richard Dunne. Attempt blocked. Philippe Coutinho (Liverpool) right footed shot from outside the box is blocked. Assisted by Raheem Sterling. Corner, Liverpool. Conceded by Matthew Phillips. Attempt missed. Raheem Sterling (Liverpool) right footed shot from outside the box is high and wide to the right. Assisted by Jordon Ibe. Substitution, Liverpool. Lazar Markovic replaces Glen Johnson. Second yellow card to Nedum Onuoha (Queens Park Rangers) for a bad foul. Foul by Bobby Zamora (Queens Park Rangers). Attempt missed. Rickie Lambert (Liverpool) header from the centre of the box is close, but misses to the right. Assisted by Jordan Henderson with a cross following a corner. Corner, Liverpool. Conceded by Robert Green. Penalty saved! Steven Gerrard (Liverpool) fails to capitalise on this great opportunity, right footed shot saved in the bottom right corner. Penalty Liverpool. Martin Skrtel draws a foul in the penalty area. Penalty conceded by Nedum Onuoha (Queens Park Rangers) after a foul in the penalty area. Yun Suk-Young (Queens Park Rangers) wins a free kick on the left wing. How did Lawro fare against Bill Wyman?